Many people get tattoos but don’t know their meaning. That will not happen to you because this post is about tattoos with meaning. Getting a tattoo is great, but if you don’t know the meaning, it’s just not right. I mean tattoos are supposed to represent your character, your values, the things you hold most dear to you. If you don’t know what your tattoo represents, then it’s just a stain on your body. So today I decided to share a collection of tattoos and their meanings since that’s something we usually don’t know. So this collection includes 32 types of tattoos and meanings. It includes tattoos for both, men and women. It includes detailed full body tattoos and it includes small and subtle tattoos. It includes the cutest ones and the boldest ones… but before all these tattoos, let’s see what can go wrong if you don’t know the meanings of tattoos. Halloween is just around the corner, you will love these awesome Halloween tattoos. If you don’t know the meaning, things can be disastrous. Especially, if you are getting a tattoo in a foreign language. This especially happens with Chinese and Japanese tattoos. People get them, and then someone tells them what it means. Things can go really really bad. So, now let’s get on with our collection. I’ll begin with one of my favorite types of tattoos here. This is the semicolon tattoo. This is one of the most popular type of finger tattoos. But what does it represent? A semicolon in English grammar means a pause, but not period. Which means that a semicolon is a break but not the end of the statement. Similarly, semicolon represents that a will of the character. It says that my story is not over yet. It says that I’ll be back. It says that the game is not over. Tribal tattoos originated about 5000 years ago during the Bronze age. Today, they signify courage, hardwork and boldness. In some European cultures, they have also been considered as a form of membership. Members of the same association, organization or cult used to wear similar tribal tattoos to identify themselves. I didn’t even want to include these tattoos, they contain so horrible meaning. But then I guessed, this post is all about tattoo meanings so you must know them. “We must secure the existence of our people and a future for White Children.” -David Lane, Nazi Leader. And 88 is the shorthand code of HH, which means Heil Hitler! In shorthand, 8 refers to eighth letter of the alphabet 88 means HH, Heil Hitler. Now you know why 1488 tattoos are only found in prison. I’ve heard that in most of the countries of Europe, 1488 tattoos are banned. Anchor tattoos are one of the most popular types of tattoos around the world. Probably Popeye the sailor made them famous or probably it’s just that they symbolize so many things such as strength, stability and holding on. It shows resilience and it shows faith. Anchor tattoos are liked by men and women alike. Mexican sugar skull is a unique type of tattoos. These tattoos are designed to commemorate the departure of loved ones. There was a tradition of making a sugar skull and writing the name of the deceased person on it. Contrary to perception, butterfly tattoos do not necessarily represent beauty. On its core, it signifies with transformation and hope. A butterfly starts its journey from being an ugly caterpillar and transforming into one of the most beautiful creatures on earth. Single feather tattoo is a sad tattoo. It usually represents loss and death, but you should always check what kind of feather tattoo you are getting because the feather carries the characteristics of the mother bird so her characteristics is what the tattoo will hold. Owl is the symbol of wisdom, but not just that; it is one of the most lethal predators in the world. Some owls boast of 100% kill rate. That’s something that shames the great white sharks and bald eagles. 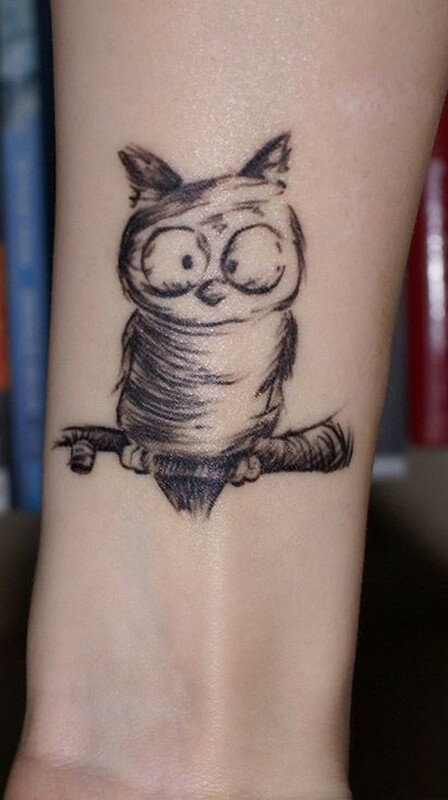 So owl tattoos symbolize brawn with brain. They symbolize balance of mind and muscle.